Thanksgiving is a special holiday in our family. We’ve done many large family gatherings, and we’ve had very special friend Thanksgivings when we couldn’t get back to see family. We look forward to so many things when it comes to Thanksgiving, including a delicious turkey dinner. But why does Thanksgiving have to be the only time to have turkey? The large turkeys are only available around the holidays, but normally you don’t need that much meat for your family. I stumbled upon these small turkey roasts at the grocery store, and they are the perfect size for a family meal. The roast are consistently available, and you won’t have leftovers for weeks. The first time I made a turkey roast was in the oven, and it was a winner with the whole family. This time I needed a little more time-freedom to get things done. So, I pulled out one of my favorite kitchen tools for busy families, the slow cooker. 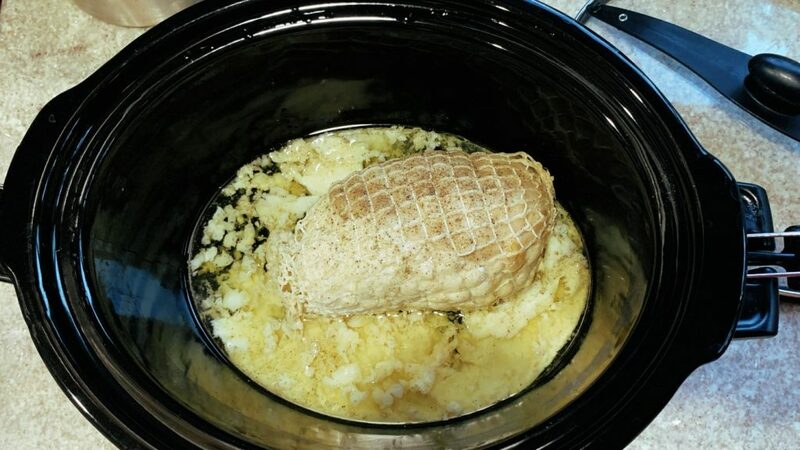 First, dress the turkey roast really simply with olive oil, salt and pepper, and let the slow cooker work its magic. Let the roast cook on low all day, and it comes out moist and delicious. 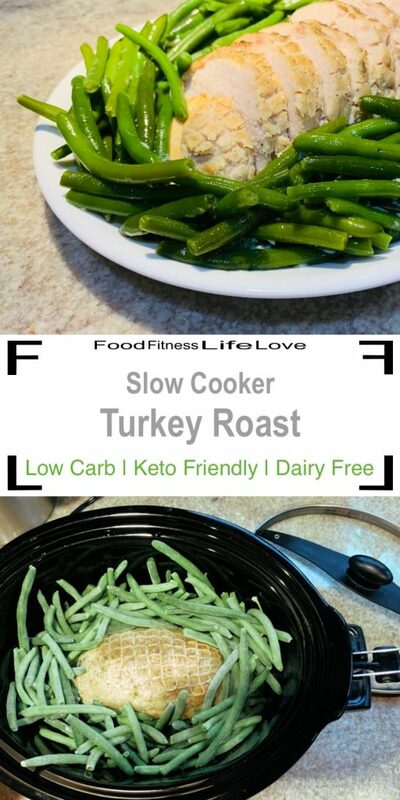 You can simply cook the turkey roast in the slow cooker or add vegetables toward the end. In this case, I added frozen green beans about 1- 1.5 hours before dinner. 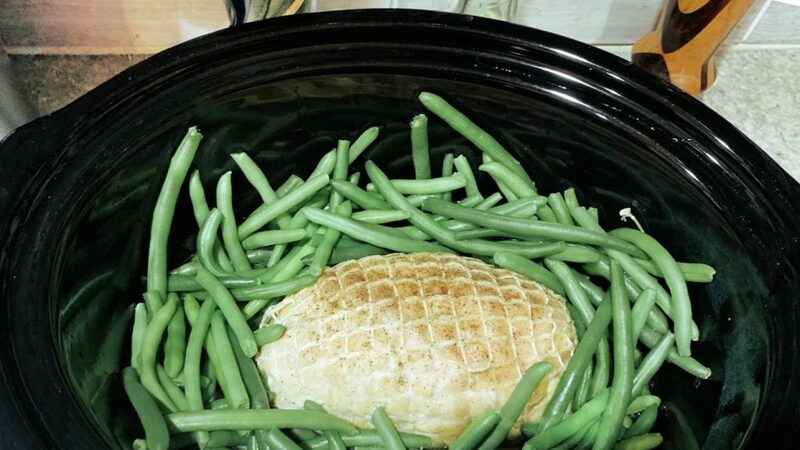 When it’s time for dinner, take the turkey roast out of the slow cooker. Remove the string netting and slice for serving. Let the vegetables sit in the tasty juices and toss them around to pick up some of that slow cooked flavor. If you want to add fat to get all your macros for the day, toss the vegetables in butter or olive oil. 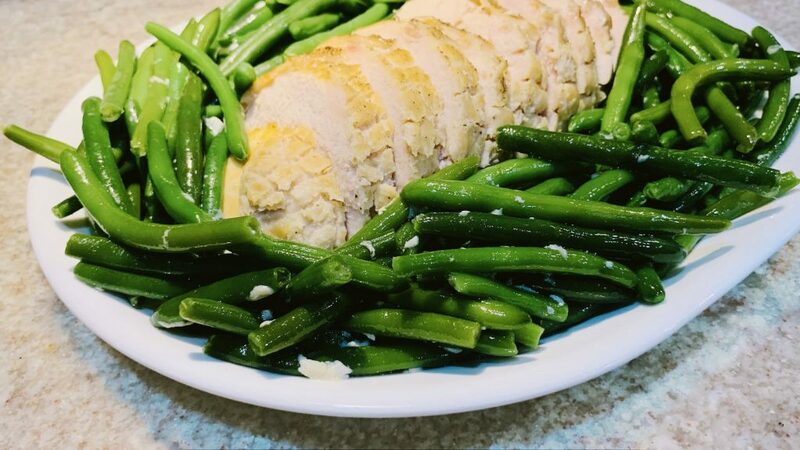 Serve the vegetables alongside the sliced turkey roast. Enjoy your Slow Cooker Turkey Roast with Vegetables any night of the week. Remove the Turkey Roast from the packaging but not the string netting. 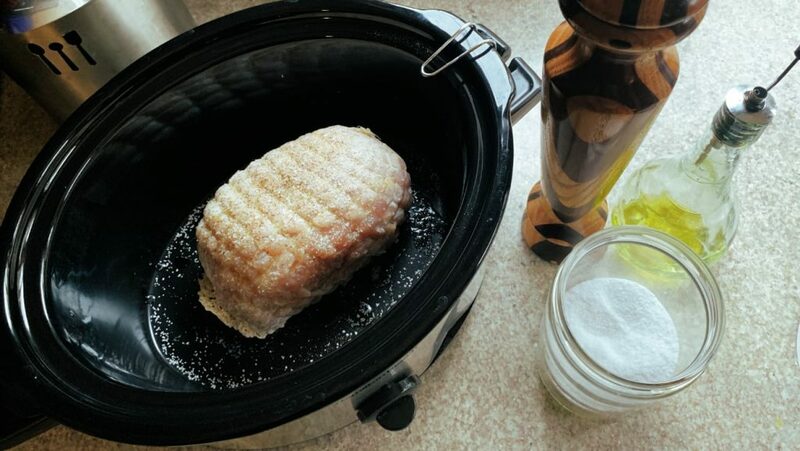 Place the roast in the slow cooker drizzle with olive oil and season with salt and pepper. Turn over the roast and repeat. Add the chicken broth to the slow cooker, but do not pour it over the turkey roast. Cook the roast on low for 7-8 hours. 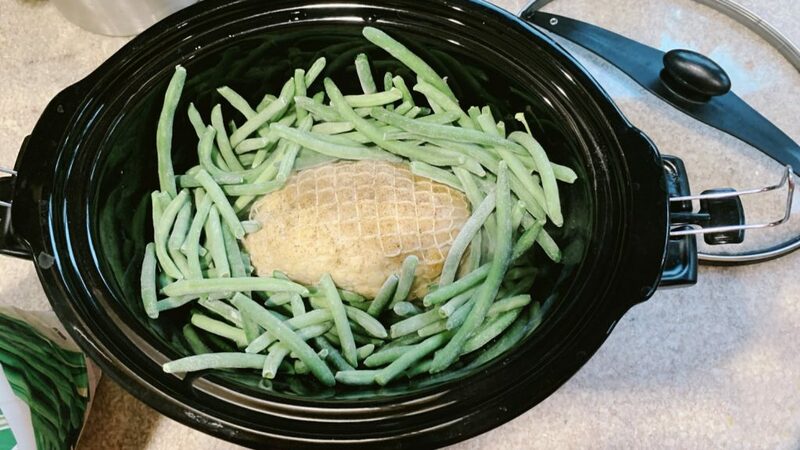 About 1 to 1.5 hours before you’re ready to eat, add the frozen vegetables to the slow cooker around the turkey roast. Continue to slow cook for another hour or so. When it’s time to eat, remove the roast from the slow cooker and slice. 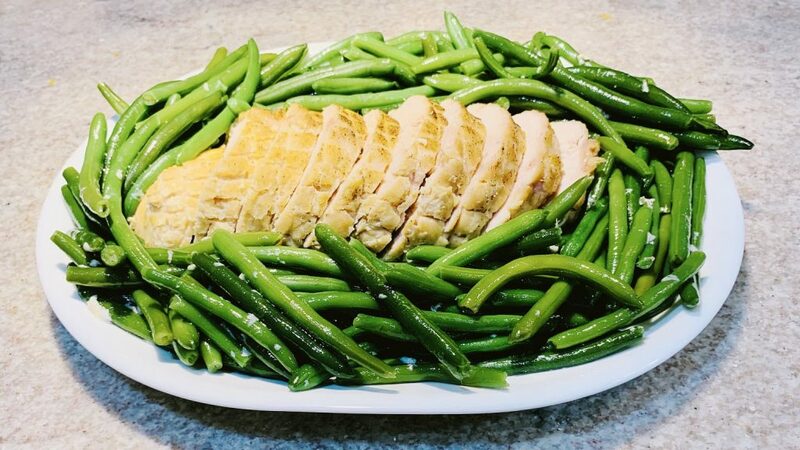 Serve the sliced turkey with the vegetables.